During a recent trip to Cesky Krumlov, I was informed that it is a UNESCO World Heritage Site. This got me thinking about how many more UNESCO World Heritage Sites there are in the Czech Republic. Those thoughts resulted in this article. While doing the necessary research, I was pleasantly surprised by how few of these places I had actually been to. So far, I have only ticked 5 of them off my list, but I’m really excited to get started on visiting a few more of them. With the days getting longer and warmer and the summer holidays just around the corner, what better time could there be to start checking out some of these amazing locations? What is the significance of being a UNESCO world heritage site? To make the list, a place must be considered a landmark. This can be because of historical, scientific, natural, or cultural significance. Often, UNESCO world heritage sites are selected because they serve as a symbol of our intellectual history and development. UNESO world heritage sites can also be selected because their preservation is considered to be in the interests of humanity as a whole. How many UNESCO World Heritage sites can be found in the Czech Republic? The Czech Republic contains no less than 12 UNESCO World Heritage sites! This includes not only the Historic centre of Prague but also Pruhonice Castle and Gardens, to the southeast of the city. 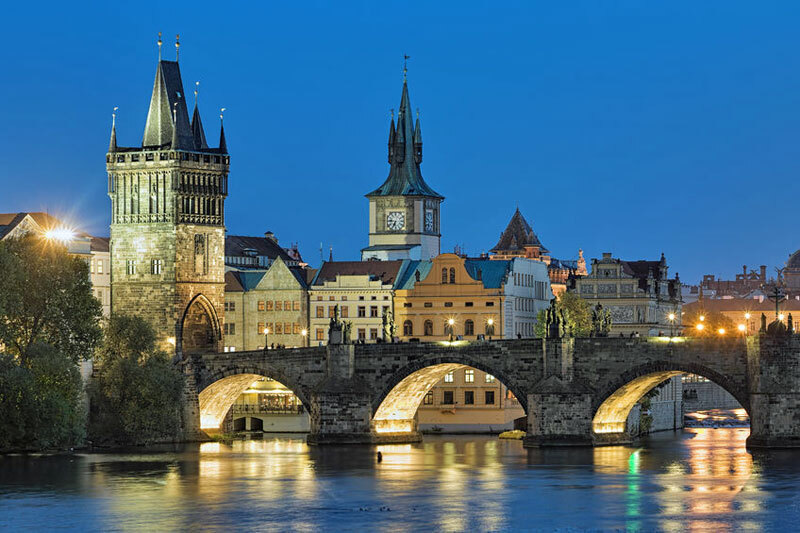 Prague contains many outstanding examples of Gothic, High Baroque and Modernist architecture. In the years following 1900, the city strongly influenced the development of Central European architecture. Because the historical centre of Prague has been lucky enough to avoid large-scale demolition and urbanization, it remains remarkably faithful to its Medieval roots with regards to its layout. As you walk through the city of Prague, it is still very easy to get a sense of its history and development. This is because it still contains a wealth of monuments and landmarks from many periods of history and incorporating many architectural styles. Throughout history, Prague has been associated with some of the most significant names in art, science and politics. It is hard to think of names such as Franz Kafka, Vaclav Havel and Mozart without also thinking about Prague. Charles University (founded in 1348) is one of the oldest and most distinguished universities in Europe. If you have never visited Cesky Krumlov, it really is a must. Even though it’s quite far away from Prague (180 kilometers), there is a good bus and train connection. For more information on what there is to do and see, check out our article about the town. Like Prague, Cesky Krumlov still retains much of its medieval charm and is seen as a superb example of what a small town would have been like in the Middle Ages. Its architecture is a faithful representation of its development through the centuries. Many of the buildings here are superb examples of their period and of their particular architectural style. The town is home to some exceptional decorative facades and many buildings have maintained their original layouts and interiors. 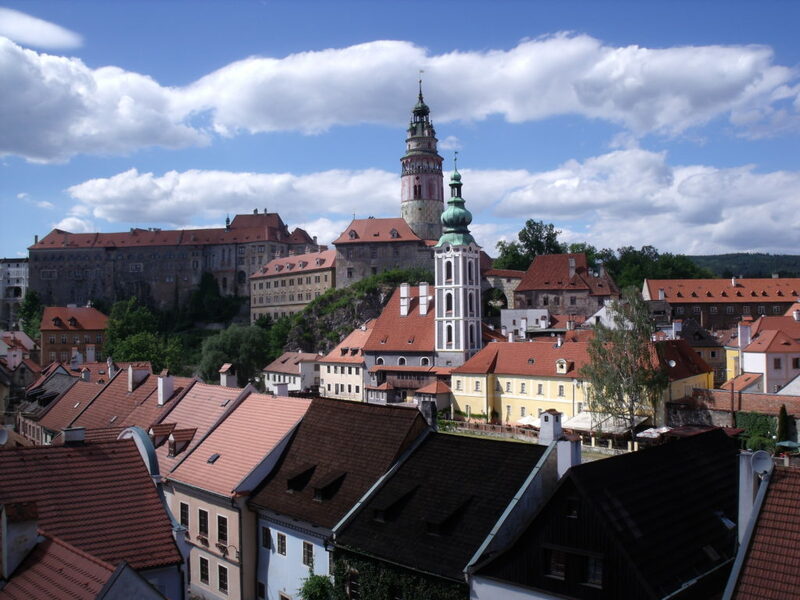 The landscape of Cesky Krumlov is dominated by its exquisite castle and gardens. 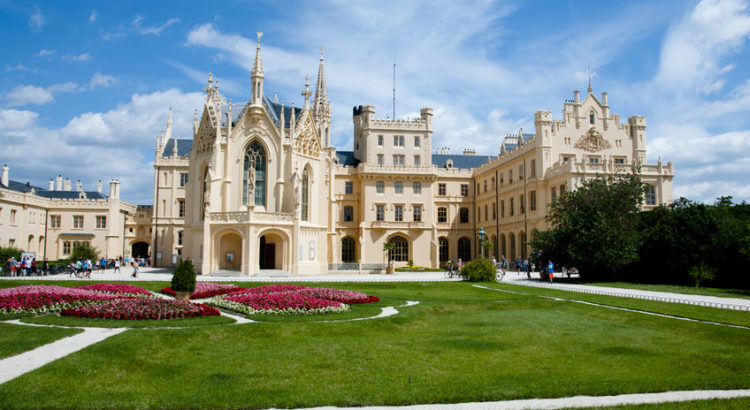 The castle is made up of many elements and incorporates fine examples of Baroque, Gothic and Renaissance architecture. This includes the town’s historic centre, the Church of Saint Barbara and the Cathedral of Our Lady and St. John the Baptist at Sedlec. Kutna Hora was originally a mining town. Rich veins of silver ore run through it, which were discovered in the late 13th century. As a result, the town became enormously prosperous and hints to that lavish luxury can still be seen today. The masterpieces of the Church of Saint Barbara and the Cathedral of Our Lady and St. John the Baptist at Sedlec went on to have a massive influence on subsequent cathedrals that were built in the Central European area. It is a fantastic example of a medieval mining town, with only minor adjustments and alternations over the years. 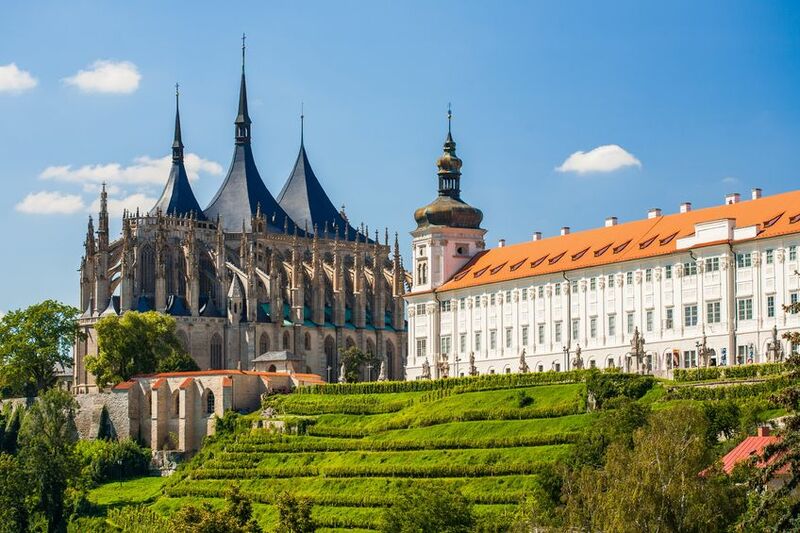 TIP: Kutna Hora is only around an hour away from Prague by train and also contains a creepy church made from bones and skulls! 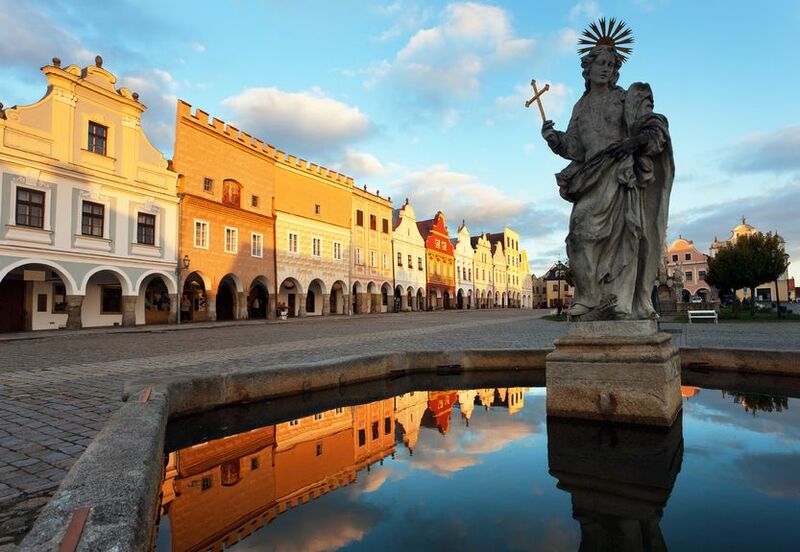 The town of Telc boasts a truly picturesque hilltop setting. The historic centre of this unusual town is protected, along with its castle. The main square here is definitely not to be missed. It is actually triangular and is surrounded by a spectacular collection of small buildings, decorated in a wide array of different styles. The town still retains some very interesting and unique defensive features. As it was completely destroyed by fire in the 14th century, it is surrounded by a strategic network of fish ponds. It also retains its original city walls. The centre of Telc is its castle, which dominates the landscape. It has been able to maintain many of its original features, design and architecture. During the late Middle Ages in central Europe, many settlements were built in virgin forests. This was a way of trying to gain political advantage and of gaining more land. Telc is the best surviving example of this. Nestled in the beautiful South Moravian countryside, this valley stretches between 2 grand chateaus (Lednice and Valtice). Measuring 200km2, it is one of the largest artificial landscapes in Europe. This landscape is a truly exceptional creation, which brings to together cultural monuments, original natural features and also some more exotic flora and fauna. It is quite simply a creative masterpiece. Baroque, Classical and Neo-gothic architecture were combined to create a space which took its inspiration from the work of English landscape artists. 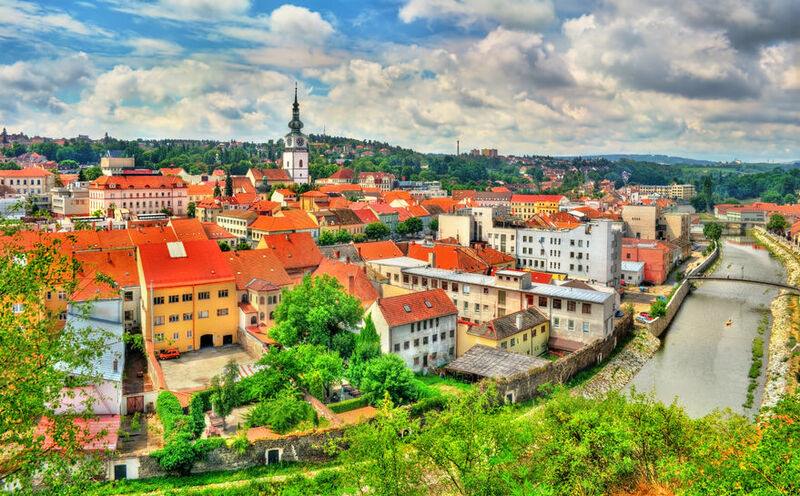 It led the way for similar projects throughout the Danube region. 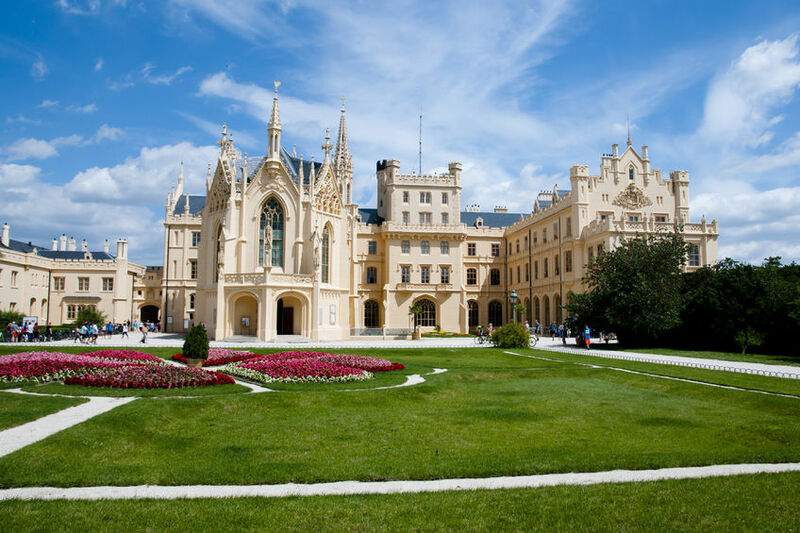 The Lednice-Valtice Cultural Landscape is a wonderful example of cultural landscape designed by a single family throughout many periods in history. Not to be confused with Prague’s very own Holesovice, Holasovice is a tiny village to be found 17km west of Ceske Budejovice. It contains 23 distinctive farmsteads, which are located around the edge of a small village green. Holasovice is exceptionally well-preserved, so it offers an amazing insight into life in a traditional rural settlement in Central Europe. 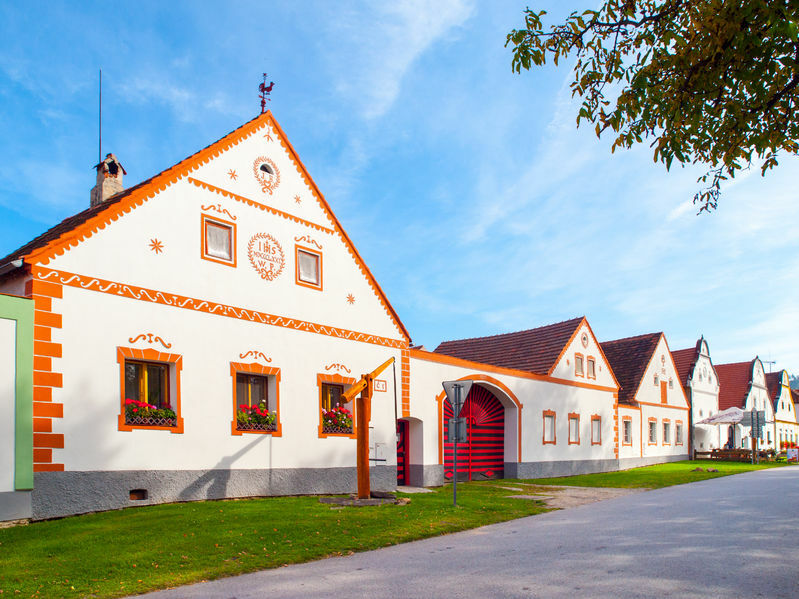 The facades of the farmsteads in Holasovice are decorated in a “Folk-Baroque” style. They stand out as one of the best-preserved examples of “Folk-Baroque” in its early stages. This is a memorial column, which was erected at the start of the 18th century. It is the best example of this kind of religious monument in Central Europe and measures an astonishing 35m. This column was built in a style known as “Olomouc Baroque”. If you’ve seen this column, you will know just how impressive it is! The column in Olomouc is considered to be an outstanding relic, relating to religious devotion in Central Europe. It is also a unique example of Baroque artistic expressionism. Litomysl Castle brings a little slice of Italy to the Czech Republic. It is an example of a Renaissance arcaded country residence, which is a style originally invented by the Italians. Its construction was completed in 1580 and it has maintained much of its original Renaissance charm. One of this castle’s most impressive features is its neoclassical theatre, which dates back to 1797. The complex also includes a French formal garden and an English-style landscaped park. The arcaded Renaissance style came from Italy, but Litomysl Castle is an excellent example of how this style evolved in the Czech Republic to create something that is both unique and rather beautiful. Litomysl Castle is also a great representation of how Central European residences developed and expanded over time, seamlessly incorporating different artistic and architectural trends. Kromeriz viewed from above is simply a treat for the eyes. It is a superb and immaculately preserved example of what is known as a “Baroque Aristocratic Ensemble”. The garden itself is a masterpiece and contains many examples of rare and exotic plant life, alongside many sights of architectural interest. It contains ornate bridges, greenhouses, a maze and a 224m long arcade displaying statues and busts. In addition, you will find a classical circular colonnade, built to hold statues from Pompeii. The garden is known as the Pleasure Garden, so make of that what you will! 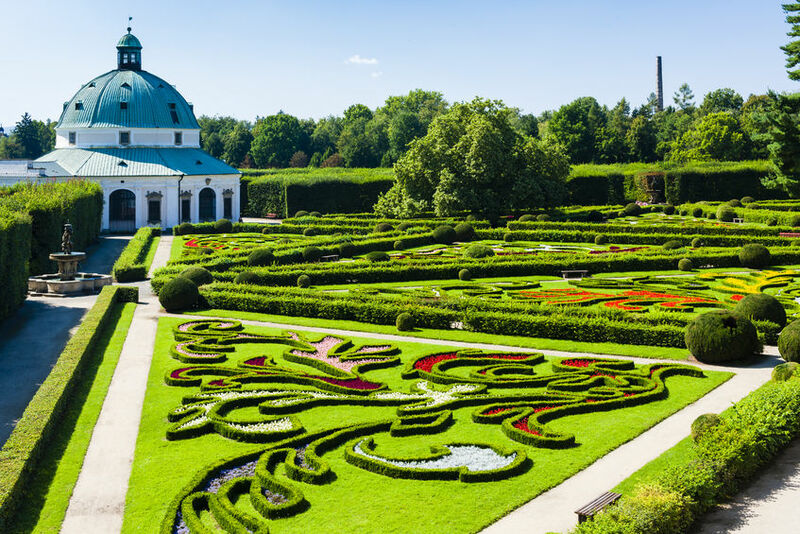 The Pleasure Garden at Kromeriz Castle was hugely influential in the design of Baroque gardens in Central Europe. The Castle and Gardens are a superb example of a 17th-18th-century prince. This includes the Jewish Quarter (which was a former ghetto), the Jewish cemetery and the Basilica. A trip to the Jewish quarter will give you insight into the restrictions that were placed upon the Jewish community and how they were forced to live. The layout of this part of the town has remained untouched and many buildings have maintained their original functions. Details such as rooves, facades and the internal layout of homes and businesses have also been left very much as they were. This area gives us clues about the coexistence of the Jewish and Christian cultures from as far back as the middle ages up until World War II. It also tells us about the life and cultural activities of the Jewish community in central Europe. This is a highly unusual church, built in the eccentric style of architect Jan Blazej Santini. It doesn’t really fit into a prescribed architectural style, but experts have called it something between neo-Gothic and Baroque. Construction on the church was completed in 1727 and it was built in honour of Jan Nepomuk, whose statue you can find on Charles Bridge in Prague. Legend claims that he was unceremoniously thrown into the Vltava, after he failed to divulge the secrets of the Queen of Bohemia to her husband, King Wenceslas IV. This architectural styling of this church represents a unique bridge between the Baroque and the neo-Gothic. Reading through this list, the Tugendhat Villa really stands out from everything else. It is here because it is a masterpiece of the Modernist movement in architecture, which was developing around the 1920s. It was a home designed for modern life and even today, it remains a truly innovative structure. The pure clean and decidedly minimalist exterior of this Villa will take you by surprise and leave you wanting to know more. 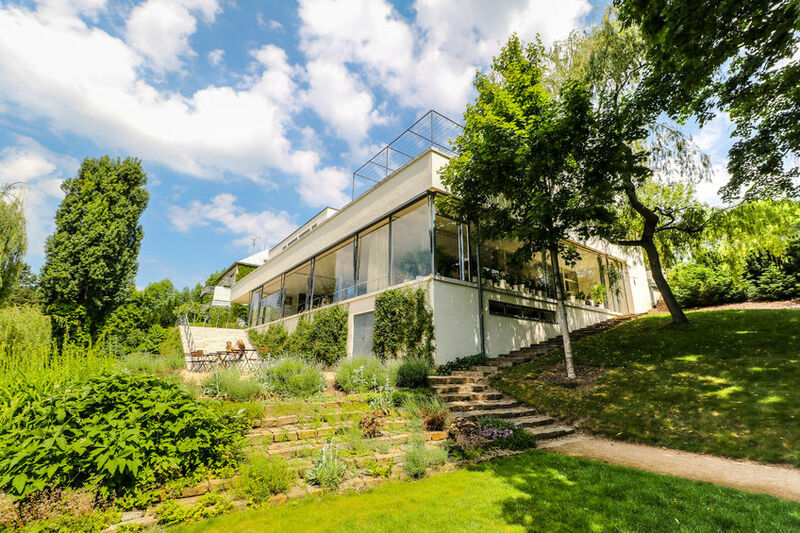 The Tugendhat Villa comes with a fascinating history. In 2009, its story was the subject of novel called “The Glass Room” by British author Simon Mawer. The architect of this building was Mies van der Rohe. He was one the central figures behind the Modernist movement and he played a vital role in ensuring its progression. The Tugendhat Villa is the finest example of his work and it perfectly exemplifies the underlying principles behind the movement. Which is going to be the next one on your list?